Finger joints are an effective and striking alternative to traditional dovetail joinery. Although the finger joint is not mechanically interlocking like a dovetail, the joint is amazingly strong. Today's modern adhesives and the large glue surface make the finger joint equally as strong as the dovetail throughout the life of the adhesive. 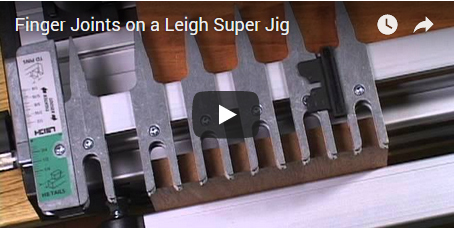 Two sizes, 5/16" and 5/8", of finger joints are possible using the standard finger assembly of all Super Jigs and the unique Leigh e-Bush provides the essential adjustment for an absolutely perfect fit. 1 Make sure the finger assembly is in the Half-blind Tail mode and the scales are indexed on the small black triangle. All finger joints are routed in the Half-blind Tail mode and this scale setting. 2 Use the included spacer in the #1 position to precisely space all fingers across the joint. 3 Clamp the first board (pin board) vertically against the side stop. 4 Use the included Leigh e-Bush template guidebush set at the #5 position and the included #140-8 straight bit. 6 Insert the spacer in the front side stop in the #2 position. This will offset the socket board. 7 Clamp the second board vertically against the spacer and rout in and around all guide surfaces.